Young BSF ended in Bled with a panel and round-table workshop organised in close cooperation with Italy, which currently chairs the OSCE. 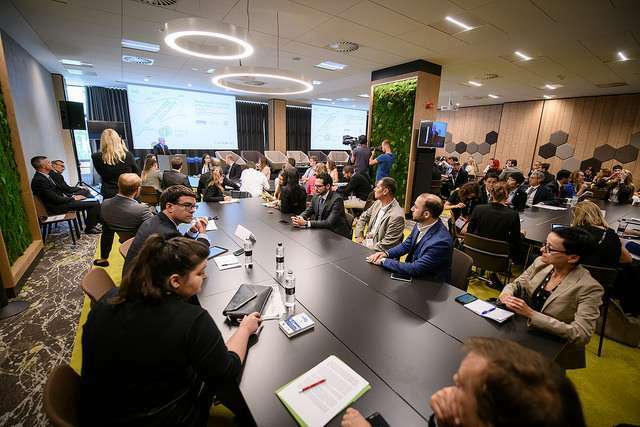 Slovenian Foreign Affairs Ministry State Secretary Iztok Mirošič delivered the first address, in which he pointed to the youth as one of the groups most susceptible to radicalisation. This is why it is necessary to provide it with opportunities for jobs, education and active involvement in political processes.Another challenge faced by the OSCE, EU, and the Mediterranean region are migrations. Youth is also the group widely affected by negative developments related to this, especially through the use of technologies like social media. Mirošič highlighted efforts in Slovenia at fostering an atmosphere of tolerance, for instance through a Foreign Ministry-developed teaching tool intended for pupils in Slovenian schools, who learn about the experience of children refugees. The state secretary also emphasized gender equality efforts, pointing out women are a vulnerable group in migration-related trafficking in people while they also have strong capabilities in the processes of deradicalization and reintegration. “Security is inextricably linked to gender equality,” he stressed. Matjaž Nemec, the chair of the Slovenian National Assembly’s Foreign Policy Committee, said that the Euro-Mediterranean region has seen many new bonds develop but also tension arise. The challenges require a stepped up effort in the context of OSCE-Mediterranean cooperation. He also highlighted the issues raised by Mirošič, arguing the youth and its role is being underestimated. “They have the predominant feeling that they live on the margins of society with no voice of power,” he said, expressing the fear things will sooner or later erupt in political instability, economic crises, ethnic religious tension, migration. Occasions and opportunities like today’s can be a good source of pressure on governments to further develop strategies and plans at international, regional and local levels, he noted.Italian Ambassador to Slovenia Paolo Trichilo, who provided the idea for the session, focused on migrations, quoting Italian Foreign Minister Enzo Moavero Milanesi as recently describing migrations as an issue of common responsibility that “must be generally shared to the maximum extent possible without nationalistic reserves since the Mediterranean presents one of the great global challenges”. The phenomenon must also be understood as human trafficking and human slavery exploitation, “therefore we must not close our eyes and turn our head the other way”. He moreover called for action to ameliorate social and economic conditions in the origin countries of migration, taking particular account of the added value of youth. The round table discussions that followed explored some of the issues raised by the opening speakers, with one of the findings highlighted a lot being the fragmentation of opinions among the young as regards migration as well for instance in their attitude to the establishment. One topic explored was education, with the need raised to transform it so as to enable employability. The need was also expressed for a better understanding of the situation of civil society in individual countries and for maybe moving beyond just working with NGOs to directly empower young individuals. As to the migration situation in general, the need was noted to first find a common understanding of the phenomenon in Europe.